CHICAGO — An East Garfield Park middle school has made it to the semifinals of a school makeover contest that could award a $100,000 grant to fund a state-of-the-art science lab. Morton School of Excellence, at 431 N. Troy St., is among 25 public middle schools from 17 states — and the only one in Illinois — to make it to the semifinal voting round of the 2016 Fab School Labs Makeover Contest. The contest, sponsored by Northrop Grumman Foundation, aims to provide grants to improve science, technology, engineering and math (STEM) education in schools nationwide. The top 25 schools were chosen based on a scoring system that included existing classroom resources, level of need, students impacted and feasibility of upgrades and plans proposed, according to a Northrop Grumman news release. Sara Fish, a science teacher at Morton School who submitted the application in June, said the grant would help modernize the currently under-equipped science classroom to its fullest extent. "I want to turn this classroom into a true maker space with lots of engineering and experimenting," Fish said. Right now, most tools and resources in the classroom are outdated or incomplete, Fish said. There are only a handful of microscopes and three desktop computers for classes of 25 to 30 students, so each class turns into a "waiting game." Fish added there are only three power outlets in the entire classroom, which creates a hazardous learning environment due to the use of lengthy extension cords. The sparse inventory includes incomplete sets of beakers and glasses. Fish's vision of a refurbished "maker-oriented" classroom includes new desks with integrated power cords, new sets of beakers and glass, a more efficient storage system and even 3D printers. "I know that science is our future, and with a new lab, I could be instilling in my students the desire to learn and succeed in this field," Fish said. "Not only right now, but through high school, college and their future careers." Fish's enthusiasm for teaching science translates directly to how Morton School's students perceive their education. Na-Jae Campbell, 13, said she used to hate science before joining Fish's class. Now, science is one of her favorite subjects. "I love [Ms. Fish] because she makes us do all sorts of experiments and gets me interested in science," Na-Jae said. "We even dissected a beehive once!" Morton School, which opened in 1964, is considered a "turnaround" school whose management was handed over to the non-profit Academy for Urban School Leadership in 2008. Morton School principal Peggie Burnett-Wise said the grant would aid her students to be prepared to exist and thrive in a world where STEM is such an important field. "The opportunity [the Contest] provides us is the resources to better equip our students to be able to thrive in those subject content areas," Burnett-Wise said. "So it gives us an extra boost — we do everything we can do here, but this is like the creation of the dream lab." Burnett-Wise said the grant would be especially helpful for Morton, where a large portion of the student population comes from disadvantaged impoverished backgrounds. According to CPS, 98.7 percent of the 400 students at Morton live in low-income households. In addition, the school has a 35.1 percent turnover rate due to transient students in temporary living situations. "When you look at historically disadvantaged communities, to be able to open up the doors to STEM creates opportunities for our students," Burnett-Wise said. "We want them to have the opportunity and exposure to decide, 'Okay, well, maybe I will be the next Ronald McNair. I can be the next Mae Jemison.'" Burnett-Wise hopes that if the school receives the grant, students in the community will no longer feel like they need to leave the neighborhood to get a great STEM program. "That's what that $100,000 will help us do," Burnett-Wise said. "Our students want to be here, and given the opportunity, that STEM lab will be used to its fullest capacity." A grant that big would mean that students like Na-Jae would have more opportunity to pursue their dreams. 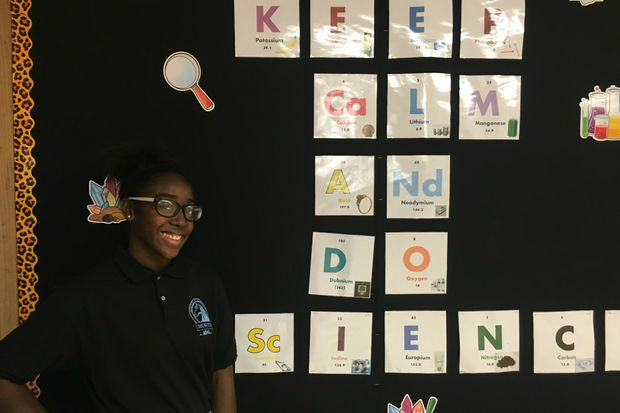 "In this neighborhood, not many people believe we can be scientists," said Na-Jae, whose dream is to become a surgeon. "So I'm grateful for the opportunity Ms. Fish provides us." Finalists for the contest will be determined through an online voting campaign, which kicks off this week on the Fab School Labs Facebook page. Like the page here for updates on the vote schedule. Anyone is eligible to vote with an active Facebook account. How Often Does The CTA Clean 'L' Cars And Buses?